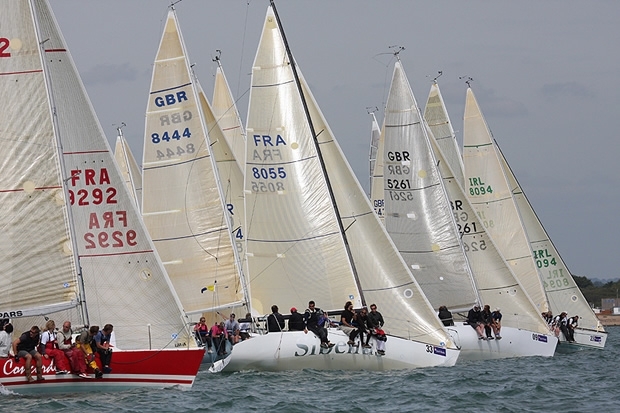 For the 38 strong fleet assembled in Cowes for the 2011 Half Ton Classic Cup, supported by South Boats, today's opening three races were confirmation that the Half Ton Class continues to go from strength to strength. Throughout each of the day's three races the fleet was tightly packed with plenty of close quarters drama keeping both the sailors and the spectators on the edge of their seats. The entry list represents a true cross section of the original Half Ton fleet with the oldest boat being the 1977 Davidson designed Waverider, owned by A Delvaus of Belgium, a double winner of the Half Ton Cup in 1978 and 1979 when skippered by Laurie Davidson himself. The newest boat in the fleet is the 1992 Ceccarelli designed Per Elisa, owned by Britain's Robbie Tregear, which was the last of the grand prix Half Tonners ever built, launching in 1992. Racing was initially postponed for two and a half hours while the fleet waited for wind but the wait was worth it with a nice 10-12 knots from 135° filling in around lunchtime. The Race Committee, led by Race Officer Rob Lamb, was able to set up shop on the Hill Head Plateau and with judicious use of a relatively short windward leeward course they achieved three races that tested the teams to the full. In the opening race Half Ton Class Chairman and defending champion Philippe Pilate's General Tapioca took an early lead on the water and on corrected time and despite the many attempts by Francois Michelin's Chani and David Cullen's King One they held their lead through until the finish. On corrected time General Tapioca won by 34 seconds from Chani with King One taking third by just three seconds. Race two went to Sibelius, owned by Jean-Philippe Cau who also took control of the race early on and then refused to relinquish their lead. Michael Kershaw's Chimp finished 57 seconds behind them with Tim and David Cunliffe's Insatiable three seconds behind that in third place. General Tapioca had to settle for fourth, just nine seconds behind Insatiable. In race three General Tapioca came to the fore again, this time winning by ten seconds from Chimp with Denzil Williams' Santa Evita third and Robbie Tregear's Per Elisa fourth. In the overall standings General Tapioca now leads the fleet by two points from Chimp which counts 8 points, with Sibelius third on 14 points, Chia fourth on 22 points and Insatiable fifth on 24 points. The event also features a special division for Production Boats, which this year features two Hustler SJ30s, two MG HS 30s, a Golden Shamrock, an Albin Ballad, an X-95 and a Hustler SJ32. Today's top performer in the Production Division was Francois Michelin's Golden Shamrock Chiani, which won the first two races and finished second in race three. Richard Hollis's X-95 Crakajax now lies in second place thanks to a 3, 3, 1 score line with Frederic Denis' Fletcher Lynd, a Hustler SJ30 two points behind in third. After racing Mike Relling, who is sailing aboard Insatiable with David and Tim Cunliffe, commented on the incredible quality of the racing: "It was very close and I think the good thing is that among the top ten boats there are only seconds between each place so mark roundings, boat handling, all of the little details are very, very important. I think that says a lot about the Half Ton Class, the success of the class and the success of IRC. The ratings seem to be pretty fair, and like any good regatta if you sail well you will do well, if you sail badly you will do badly and there's nowhere to hide. I think that makes it a fantastic event." Tomorrow the fleet will be racing around the Isle of Wight. The start is scheduled for 07.30 from the Royal Corinthian Yacht Club start line off Cowes and the fleet will round the Island anti-clockwise. With a forecast for moderate to fresh winds, a double points weighting and a no discard on the score for the race we can anticipate another exciting day. The regatta continues until Friday 26 August with up to twelve races scheduled.